I recently had the opportunity to speak with an organizational leader named “Scott” who had a 360 feedback survey tool administered on his behalf. While we offer 360 degree feedback surveys for school districts here at K12 HR Solutions, we did not administer this particular survey. In human resources, a 360 degree feedback survey is a tool used to anonymously collect feedback from members of an employee’s work circle. The feedback an employee receives helps inform their strengths and areas of opportunities so that targeted growth and development plans can be implemented. As part of the process the employee’s supervisor, co-workers, subordinates, customers, and peer professionals from related work areas are invited to take the survey and rate him/ her on several competencies which normally include trust, communication, teamwork, and business acumen. Scott and I have been acquaintances for several years and from time to time, he’s come to me with HR questions and issues. With the subject of 360 feedback surveys weighing heavy on his mind, I felt obliged to put on the coaching hat and help him talk through his feedback. As I spoke with him, I asked him to describe the process of how he received his feedback results and how he felt. He explained that a few weeks after the survey was administered, his supervisor just gave him a feedback report booklet which parsed out survey results by rater group and told him to look over it. “The results were surprising,” he said. “Actually, shocking is a more appropriate word. By and large, customers and peers gave me a lot of praise and high remarks. My subordinates and several co-workers, on the other hand, raked me over the coals. The verbatim comments were hard to read; they cut deep and screamed at me.” There was very little follow up from his supervisor, no real guidance on how to interpret the information or ways to improve upon areas where low marks were given. If you have not had a 360 feedback survey conducted on your behalf, I have to warm you; they can and will make you uncomfortable. That moment when you first read what others have said about you is very stressful. You might get upset, angry and frustrated. You may get your ego bruised and take a hit in self-esteem. But for most people, and as I found out Scott was no exception, those feelings pass after a few weeks and you start moving to a place where you can start doing something about it. Hopefully, at that time there will be a development coach available to help you put together plans for improvement and support your change efforts. Research shows that people are more likely to incur some positive changes in behavior following the administration of a 360 feedback survey when it’s coupled with several weeks of one on one coaching. Change is not an event. Change is not like some fairytale story where Aladdin magically changes into a prince. Change is a process. The survey tool is the part of the process that helps identify areas of improvement. The subsequent coaching sessions help the employee practice changes in behavior so the things they need to do better stick. Just like anything in life, “practice makes perfect.” A couple days of practice is not enough. You need weeks if not months of coaching practice session to see real change in behavior. In education, we send our students home with countless hours of homework of practice exercises to reinforce what we teach in class. In high school, an athlete may spend 15 hours of practice in one week to prepare for just one competition event on Friday night or the weekend. Yet in the working world, most organizations provide ZERO practice or coaching sessions to help leaders be better leaders or how to have difficult conversations with teachers. As I spoke further with Scott, he told me, “It’s been a couple months since I first read the survey results and I’ve had some time to digest the feedback and evaluate how I work as a professional leader.” As we talked, Scott had certainly spent some time in retrospection and reflection, and several point of our discussion came out which he asked me to share with our audience so that other leaders might avoid some of the pitfalls Scott had fallen into. Lesson #1 in 360 Degree Feedback Surveys for School Districts: Don’t Lead Others Like You Would Lead Yourself. Have you ever heard the proverb to treat others how you want to be treated? In theory it sounds good. But as leaders, it can be quite damaging to lead with this philosophy. How you want to be led, managed, assigned work, and communicated with is NOT what everyone else or anyone else wants. What is good for me is not necessarily good for you. Scott tried to lead others how he wanted to be led and shockingly, it wasn’t working and his feedback scores showed it. We all live and work in a multi-generational and multi-cultural society and everyone has unique needs and preferences. This is especially true in education as each year there are more and more millennial entering the workplace as new teachers. Do not make assumptions as to what those needs and preferences are. Talk to them and find out. And thus, here we have this turbulent nexus that we must carefully bridge. We have expectations to achieve certain results and complete certain projects. Yet, by the other hand, as leaders we must lead and develop others around us. We can’t lock ourselves in our offices and ignore others while we extinguish the various blazes that seem to surround the workplace. We have to communicate, teach and help the others around us. Sometimes we have to show them the way. Other times, when appropriate, we just need to step off the field and let our people play the game while we act the coaching role. But whatever the situation, stop asking yourself what’s best for you and start asking what’s best for them and the organization as a whole. Lesson #2 in 360 Degree Feedback Surveys for School Districts: Survey Data Does Not Lie. If you’ve had a 360 Feedback Survey before, you might recall looking at the results thinking that you have conflicting, confusing data that’s all wrong. But I guarantee, there is some truth there if you are willing to accept it. I responded to him with a gardener analogy. I dabble a little bit in growing plants from time to time and I recently started growing Hedge/ Osage Orange from seeds. I placed a few planters inside our warm house in a window seat that gets sun most of the day. Every day I go into that room and give them a little bit of water. A couple other planters I left outside. About a week ago, the Hedge seeds I placed in the window seal started sprouting. They are really thriving and growing well. By comparison, those I left outside are still frozen and dormant. Why aren’t those seeds outside growing and thriving? After all, I planted all of them right? Yes, to all the seeds both inside and out, I am the gardener. However, I’ve created two completely different environments for them to grow in. One group I pay constant, daily attention to. I water, nurture and provide a warm environment for them to grow in. For the others, I leave them alone to fend for themselves and fight through the element alone. As I finished that sentence I could see the light bulb go off in Scott’s eyes. And the data in Scott’s feedback report showed it. Lesson #3 in 360 Degree Feedback Surveys for School Districts: You Can’t Change Who You Were Yesterday. As Scott and I continued our conversation he told me that after he had time to digest his feedback, he started having the feeling that he needed to try to nurture damaged relationships. However, by the time he received the survey report and was mentally prepared to do something about it, several of the people he invited to participate in the survey because they were in his “circle of influence” were no longer in his circle. They moved on to other jobs, other cities or other departments. His opportunity to change his behaviors towards them and try to be more effective was gone. While Scott’s opportunity to influence some was missed, he recognized there were several people with whom he needed to make a concerted effort to communicate with better. Not because the survey told him “Sally says you’re a poor communicator” but because he was being honest with himself and he knew where he needed to do better. So I encouraged Scott to start setting time aside on his Outlook calendar each week to meet with different people that he works with. You’ll never have time unless you make time. So take ownership of your calendar and set time aside today. Now, if you happen to be one of those people who has a boss who likes to schedule meetings on top of your meetings and scheduled communication time, then I encourage you to immediately have that talk with your manager and explain to them the importance of what you’re trying to accomplish. Remember… communicate with everyone and that means your boss too. Things are much easier when you have your supervisor on your side. As leaders in education, parents, students and teachers will come in and out of your circle of influence constantly. If you’re waiting for an annual 360 Survey to come along to tell you how you’re doing, you’ve missed the boat. Set time aside now and commit to spending time talking with the people around you. 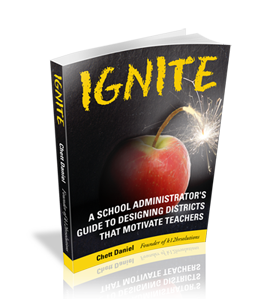 Share your vision of the district and ask them how you can work with them to bring that vision to fruition. Ensure your subordinates feel confident in critical tasks related to their jobs. Tell them thank you. Tell them they make a difference. As a leader, that’s what we are supposed to do. And you can’t do that unless you’re constantly engaged in open dialog with them. And that open dialog starts today. Be genuine and sincere. Be authentic. Be persistent, but realize that change will take time. Stay true and run the course. Feedback is a blessing and when we are honest with ourselves, it can help us grow and become better leaders. Truth be told, there is no better feedback than that which is direct, open, honest and in the present. Think back to the periods of the largest growth and change in your life. For many it was a coach, a teacher, or a professor, that provided raw, honest, and unfiltered feedback. This feedback shaped your perceived reality and subsequent behaviors that ultimately led to improved performance. There is power in having the full circle of feedback from everyone around so you can keep your pulse on the big picture and how you operate. Our 360 Degree Feedback Surveys for School Districts is especially designed to account for the varying relationships and challenges in today’s school environment. If you or your school district is interested in learning more about how 360 surveys and coaching can be used to improve school leader performance, consider contacting us at info@k12hrsolutions.com to learn more or request a free quote using the button below.